Georgia has been walking her little heart out since Easter of this year and watching her get better and faster has been an absolute riot. 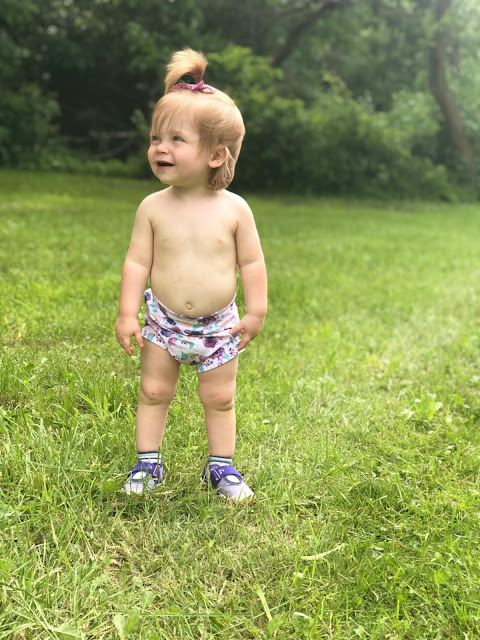 In her first days of walking she walked with her arms up at her sides to help her balance. I remember we were at my grandmas having our Easter lunch and her basement is completely carpeted, that was all Georgia needed and she just took off. Now, two months into it she's practically running! 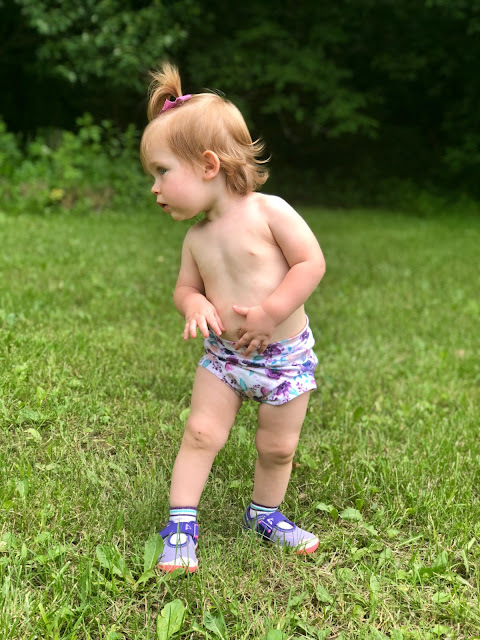 One thing I didn't really take into consideration was having a few good pairs of shoes for her, especially being a first-time walker, I really wanted to make sure she was in a good quality shoe, but also in cute shoes too. We have tried a few different pairs, but our current favorites are our Plae shoes! We have the Chloe's in Passion Flower and they are soo cute. They're super colorful, vibrant, and durable. 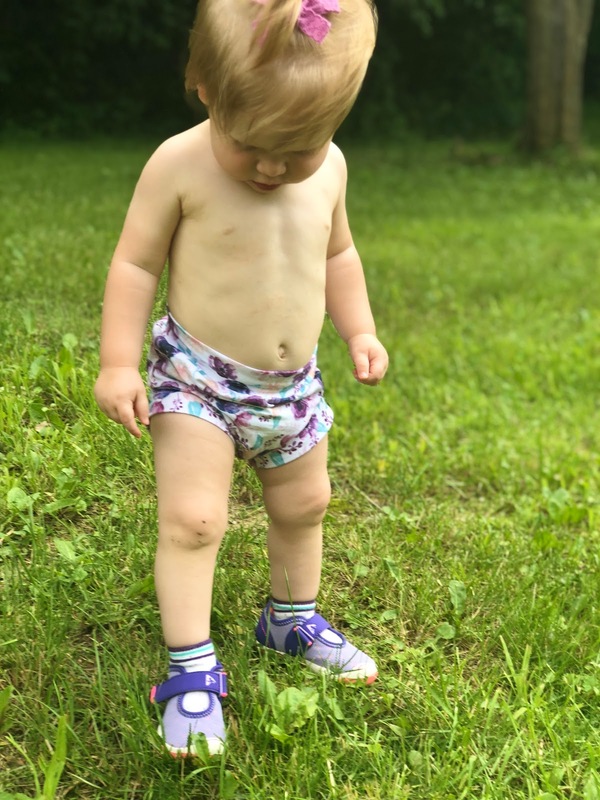 Although they're a little big for G's little feet right now, they're definitely something she will grow into as and will be able to wear through the summer and fall. We do a lot of outdoor play. We live in the country but in more of a wooded area right on a small river called the Vermillion. There's lot of fishing, kayaking, and playing in the river in the summer as it dries up and you can walk across it. 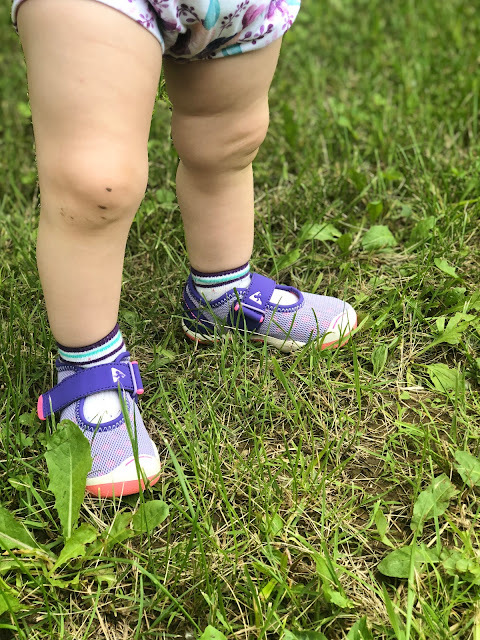 These shoes will be perfect for all the exploring and adventuring that she will be doing this summer. Joe really wants to get her in the kayaks and on the four-wheeler too so a sturdy pair of shoes will be must for those types of activities. 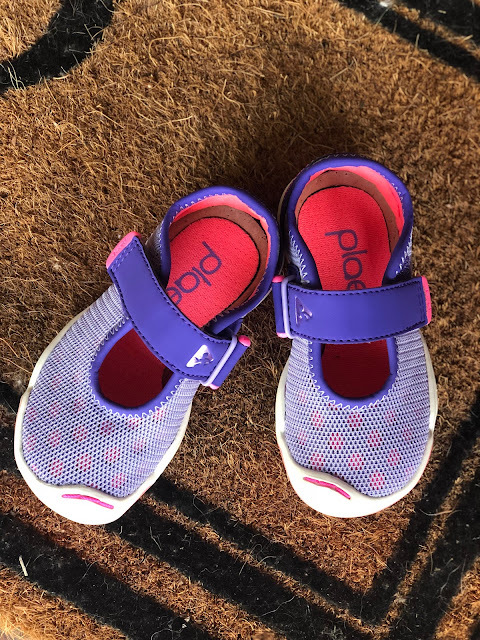 What do I love about Plae shoes? The options--lots of colors and styles to choose from. Sizing starts at a size 5 which is a little big for Georgia but I think she has exceptionally small feet for a child her age. They come in adult sizes--yep, there are adult options too! There are even combo adult + kid options. Their reason--here is the link to their mission statement in full which I absolutely love, but in short, Plae aims to make play for everyone, regardless of age! I think it's brilliant and I love how they describe play as something that is reinvented regularly by kids. So far we are loving our Plae shoes and we can't wait to create memories with our girl this summer and watch her little imagination work as she plays. You can save 15% when you buy 2 or more pairs, use code ECOBUNDLE at checkout.